Good Tuesday morning all. 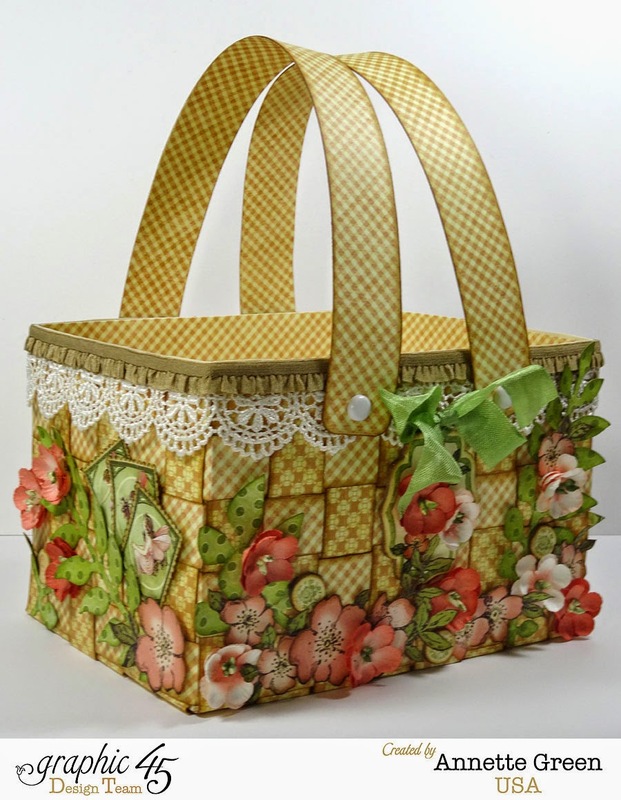 I have a pretty Spring basket and tutorial to share with you today over on the Graphic 45 blog. It's all made from the Once Upon A Springtime Deluxe Collector's Edition and it was SO much fun, I also made a mini version at the end of my video, so hop over there and check it out and let me know what you think. I'd love to hear if this is something you'd try yourself. You could also win a generous prize pack, so be sure to leave a comment on the G45 blog or Facebook page. Here's a few pics below. Have a great day! Nothing Like a Birthday Party! No, it's not MY birthday, just in case you were wondering. Just a teaser really. 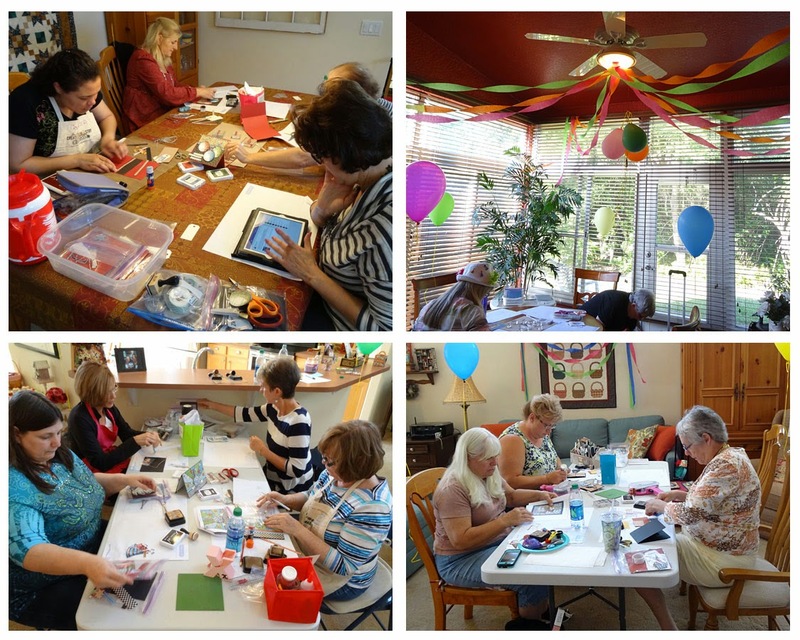 It's actually my Big Birthday Bash Card Workshop which took place yesterday afternoon. We had such fun, I had to share some photos with you. You may remember me posting this photo before, but here's another look at the cards we created. 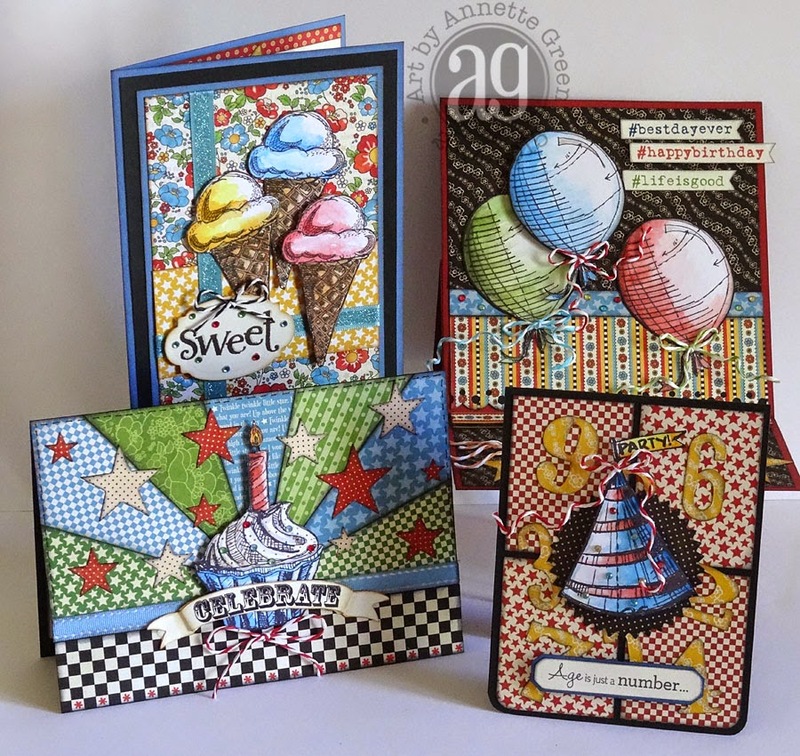 We mixed Graphic 45's Mother Goose papers (perfect with those bold bright prints) with Tim Holtz Distress Markers and Water Brush and Stampers Anonymous stamps to create four fun cards. 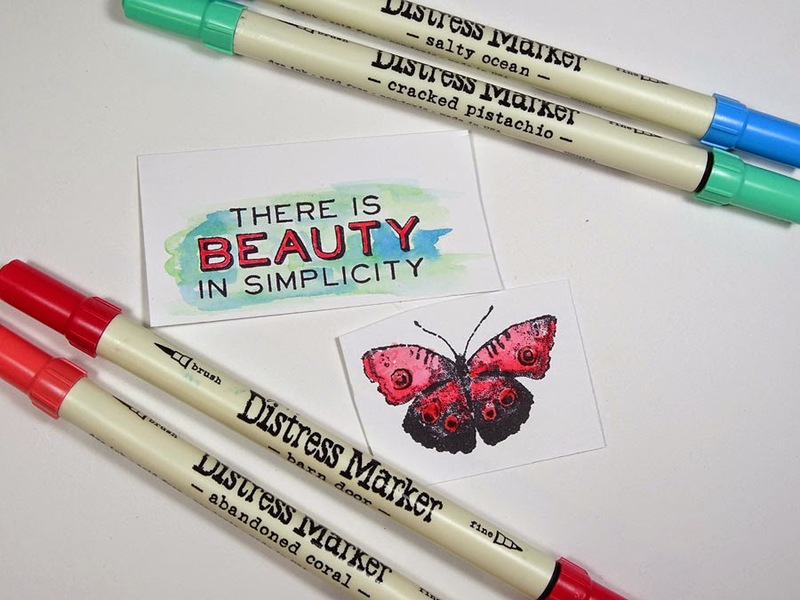 A super special shout-out and huge thanks to Tim for his generous donation of the markers and water brushes for this fun class (and more classes on the horizon!) Students learned different ways to manipulate Distress Markers with the water brush to create various effects. I loved walking around the class and seeing everyone's variations in their watercoloring. It was definitely a technique that takes a bit of practice, but the fun is in the experimentation and discovery. 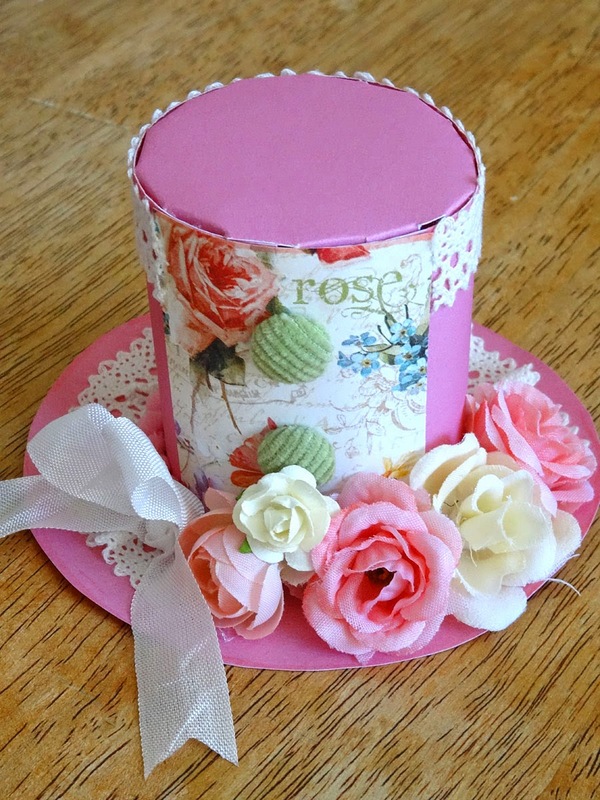 When hosting a Birthday Card Workshop, one must go all out, don't you agree? 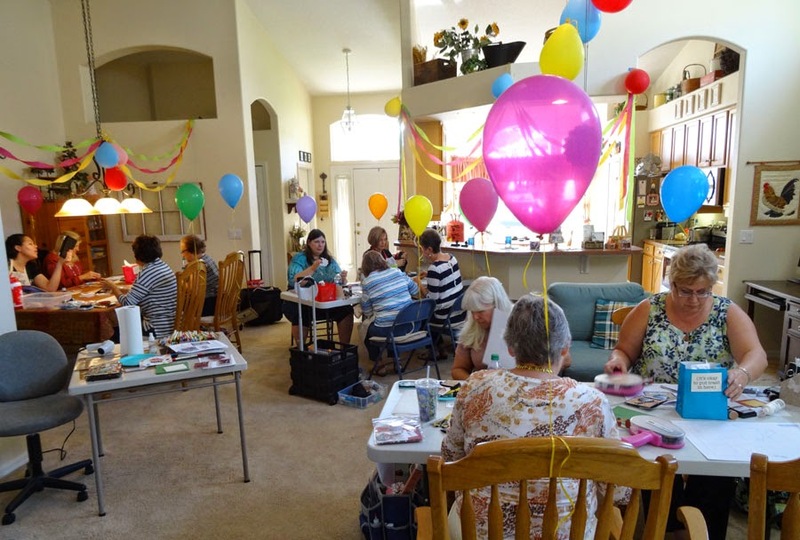 So it turned into not just a class, but a Birthday Bash complete with tons of balloons everywhere, streamers, music and cupcakes with cherries on top! Those who showed up at the party with a handmade party hat received a special gift at the door. Out of the 16 attendees, many participated. Aren't they fun? I'm there in the middle with a little fancy top hat that my Jamie made for me that morning. Here's a closer look. Sweet, eh? 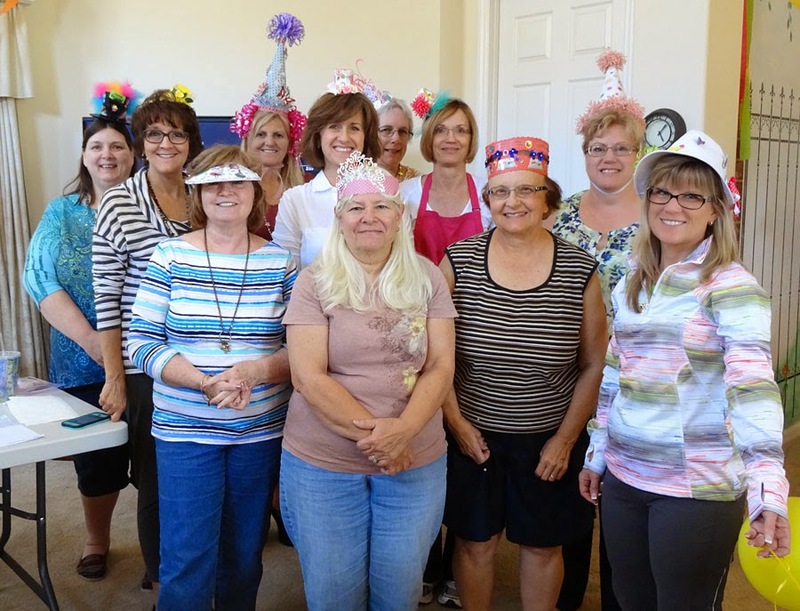 It was a great group of ladies and there was lots of laughter. 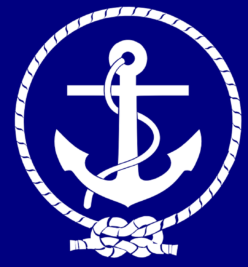 Some of them are my regulars right here in Brevard County, and others came from Orlando and all the way up in Jacksonville. Thank you ALL for coming out and sharing this fun day with me. I'll see you all here tomorrow with a fun Easter project you won't want to miss! Sorry if it seems I've gone missing here on the blog. I've got projects on all four burners but can't share a thing just yet. And this Sunday is my big Birthday Bash Card Workshop, so prepping for that has gone on for a week now. Cutting paper every day till I can't stand up anymore. Fun? Not exactly. But the end result is always fun, so I'm looking forward to that for sure. I'm happy it's another Compendium of Curiosities Challenge today. I learn so much every time I do one of these challenges. I hope YOU are joining along too. 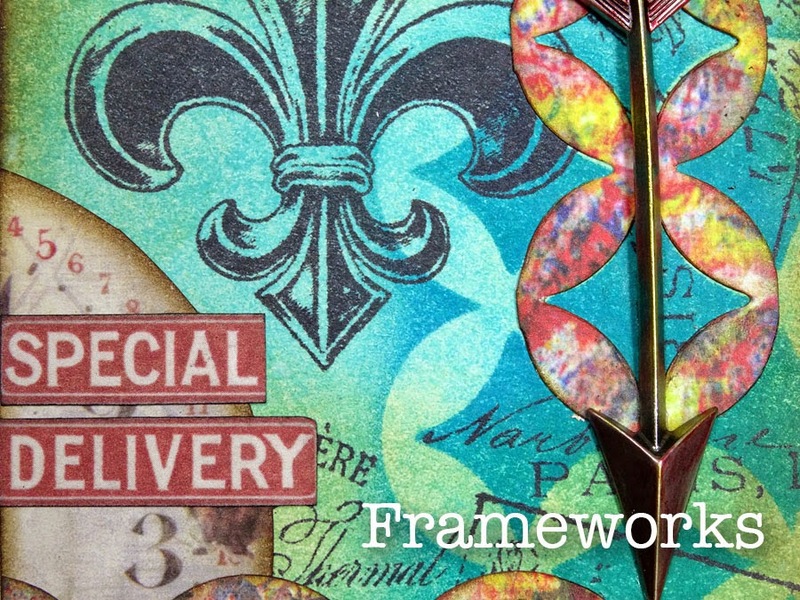 The current challenge is "Frameworks" and can be found on page 64 in the book A Compendium of Curiosities Vol. III. The Compendium of Curiosities III Challenge is hosted by our lovely hostess Linda Ledbetter on her blog. Each challenge comes from the wonderful book A Compendium of Curiosities Vol. 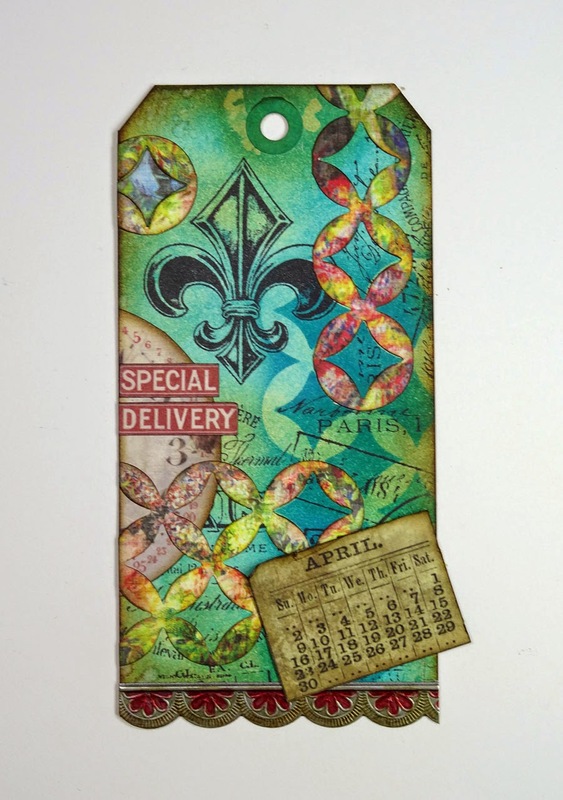 III featuring amazing products and techniques by non-other than Tim Holtz. 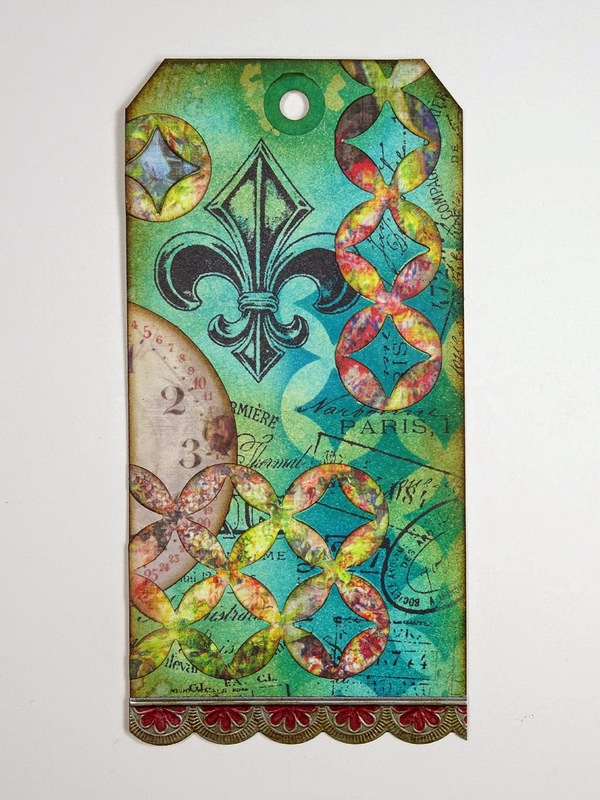 My creation this time is a tag with a French twist, and features the Courtyard frameworks die, which I acquired as a gift from Tim and Mario. How nice was that? They were kind enough to send a package to each of the Compendium Crew a few months back to help us out a bit. So generous!! Let me take you through my steps. 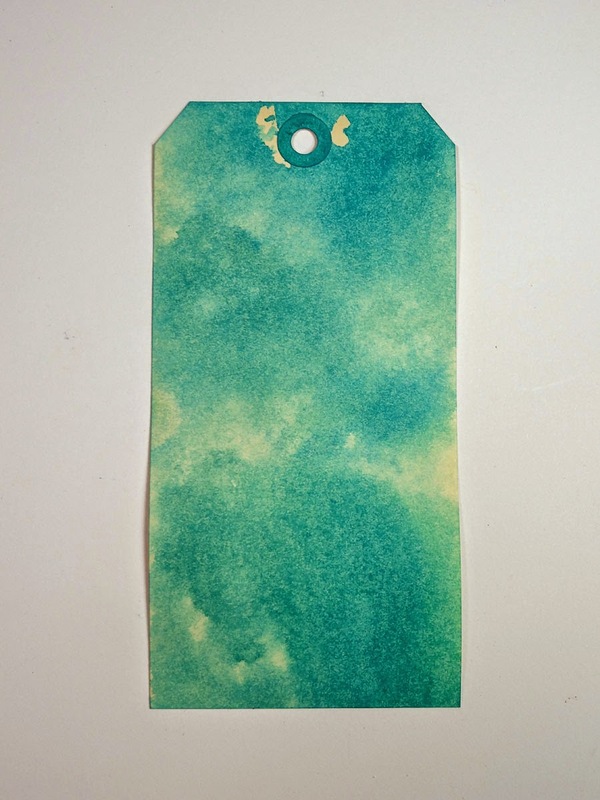 I began with a regular manila tag and dipped it into Distress Stains on my non-stick craft sheet. I used the new Mermaid Lagoon, Broken China and Cracked Pistachio. I swirled some Bundled Sage Distress Ink into the open areas, then inked my outer edges with Vintage Photo and Walnut Stain (my favorite 1-2 punch). A final spritz-and-flick with water and then I heat set it. I don't know how the spritz-and-flick trick never ceases to amaze me. Just so cool. 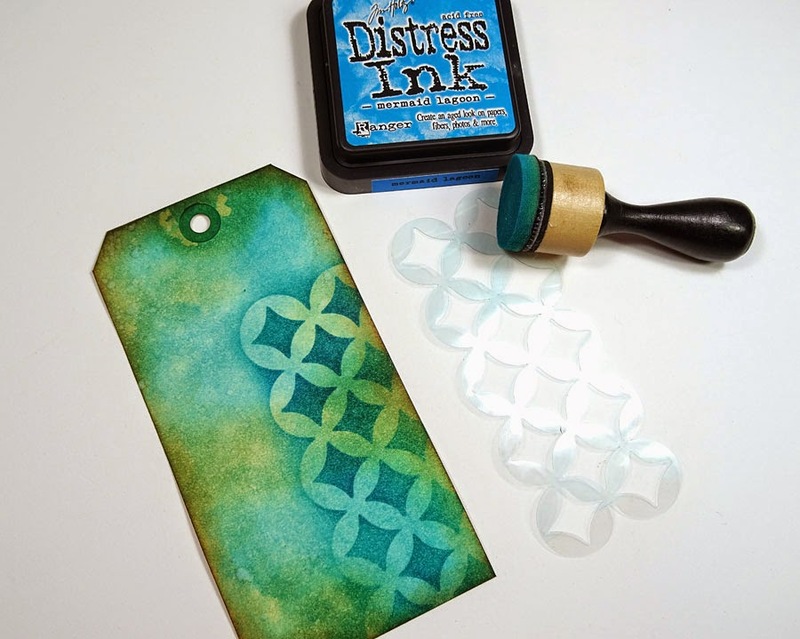 I created a stencil from the Courtyard frameworks die from a piece of Mask Sheet and swirled some Mermaid Lagoon onto my tag through it. 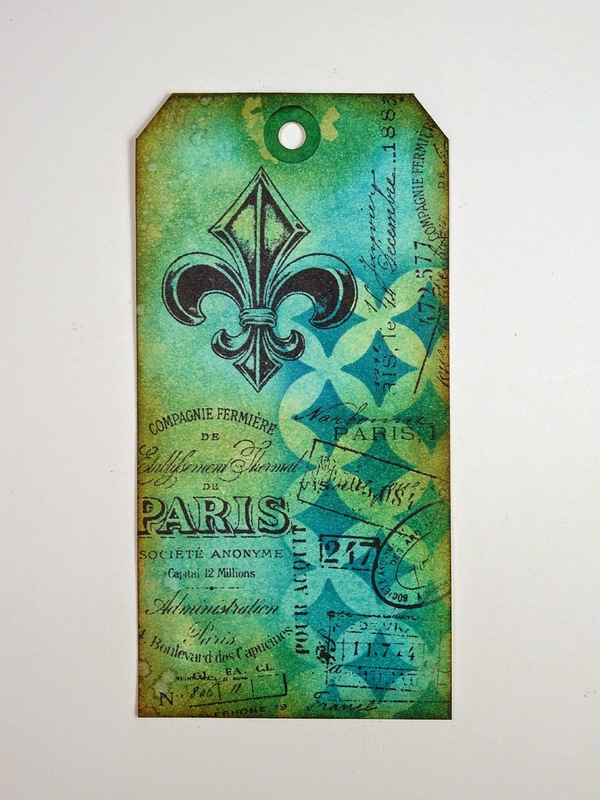 From the Paris Memoir stamp set, I stamped several images with Black archival ink. I grabbed an old favorite paper collection "Lost & Found" and cut out a clock face. From the floral paper, I die cut the frameworks die again, popping out the center pieces and adhered the frames to my tag in different areas. 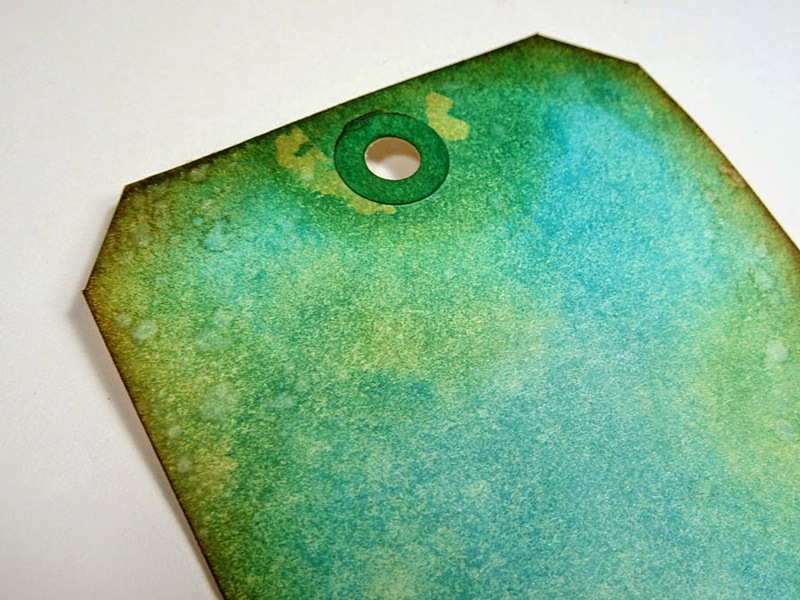 After coloring the Industrious Sticker border with alcohol inks, I adhered it across the bottom of the tag. I used the Adirondack pen with Red Pepper and Mushroom alcohol inks. From the Expedition ephemera pack, I cut apart Special Delivery and adhered it over the clock, then cut apart the April calendar from Lost & Found and, after crinkling it up a bit and inking the edges, adhered it to the lower right of the tag. 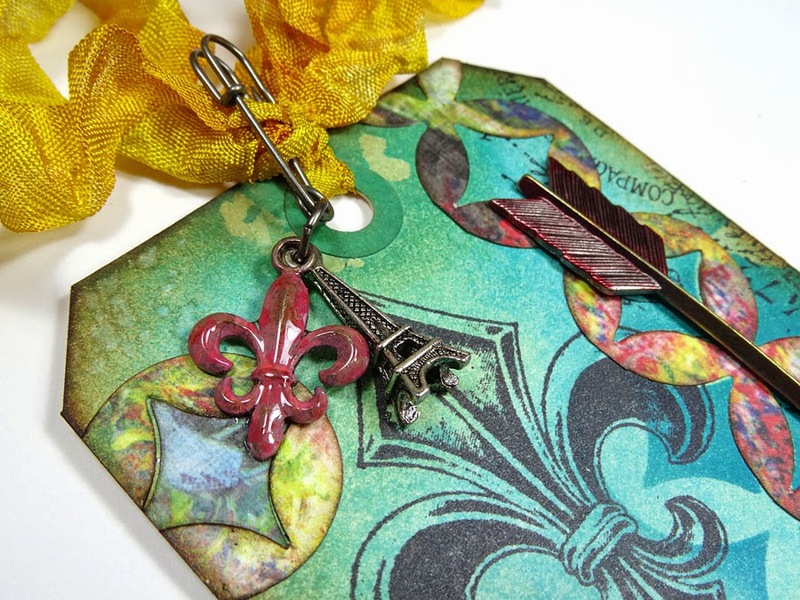 After coloring some crinkle ribbon with Wild Honey and Mustard Seed Distress Stains, I inserted a Wire Pin through the knot and attached an Eiffel Tower charm from the craft store. 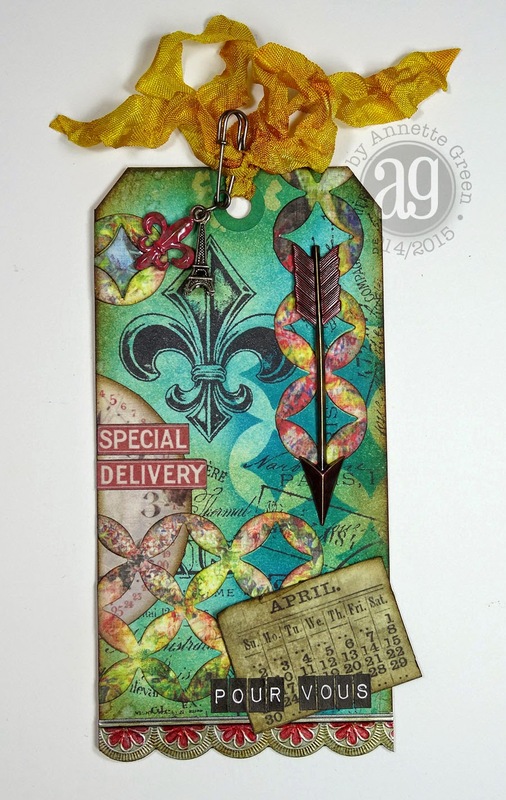 I painted the fleur-de-lis charm from the Adornments pack with Abandoned Coral and Festive Berries Distress Paints. Once the paint was dry, I tapped some Mushroom alcohol ink over the top, then finished it off with some Glossy Accents. 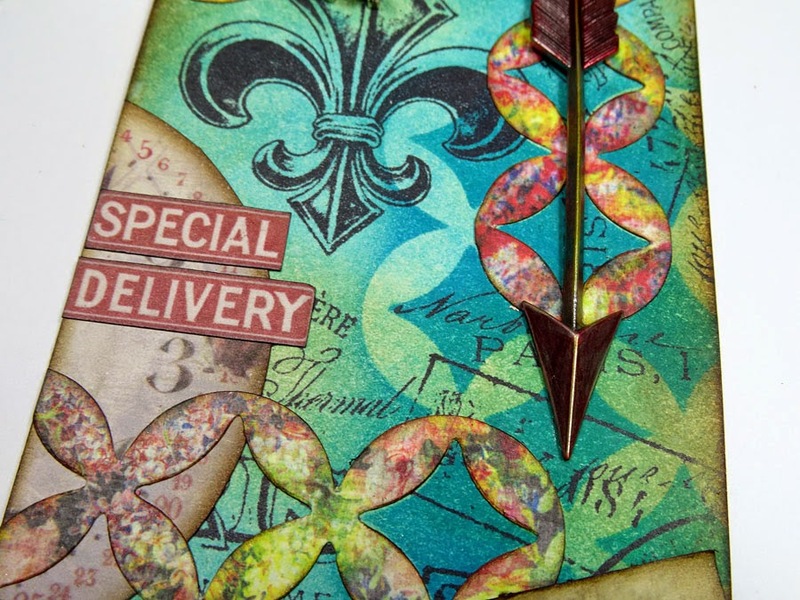 The arrow has been colored with alcohol inks as well. 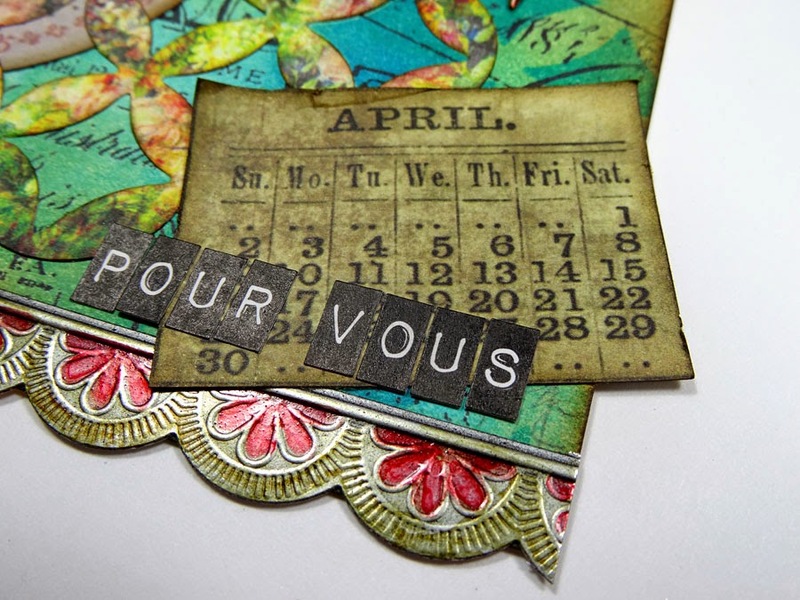 Finally, I added Pour Vous (For You) to the bottom of my tag with Label Letters. Here's a look at my tag again. Now it's YOUR turn. Grab your favorite frameworks die and try something fun! Jamie Moves to the Final Voting Round! Hello and Happy Hump Day everyone! I'm SUPER excited to share the news that Jamie's design for the Create A Greeting Card Scholarship Contest has been selected to move on to the final voting round. We have some great news! We have officially kicked off our Final voting round and your design is included! The voting period starts today and runs until 4/1/15. At the end of this final voting round, the top 5 vote getters and 5 designs that our scholarship team chooses will make up the final 10. 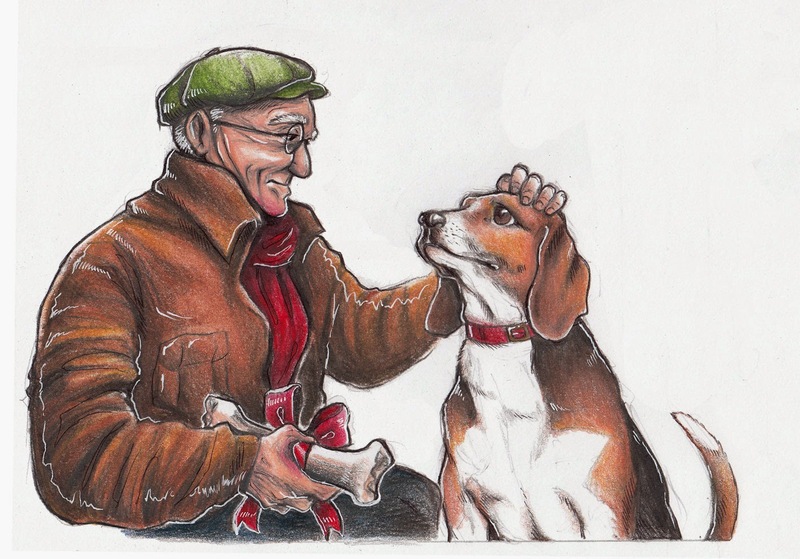 It will be from these final 10 designs that a winner will be chosen for the Create-A-Greeting-Card Scholarship Contest. We absolutely have YOU to thanks for her success. Between all of you here on the blog and the others on Twitter and Facebook who voted, YOU are the reason she's moved on. So we thank you over and over again. If you'd like to vote in this final round, here's the link, and here's another look at her artwork below. You can vote once per day every day until the voting ends on April 1st. 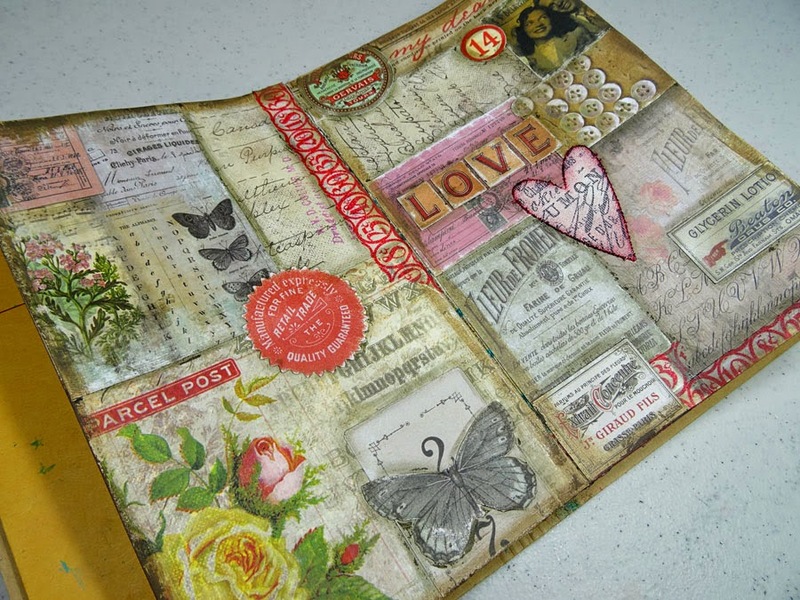 I had so much fun with the Remnant Rub Resist technique by Tim Holtz for the Compendium of Curiosities Challenge yesterday, I had to try it out on some art journal pages this afternoon. Plus I wanted to share even more journal pages I created last week that are inspired by Tim's 12 Tags of 2015 which you'll see below. 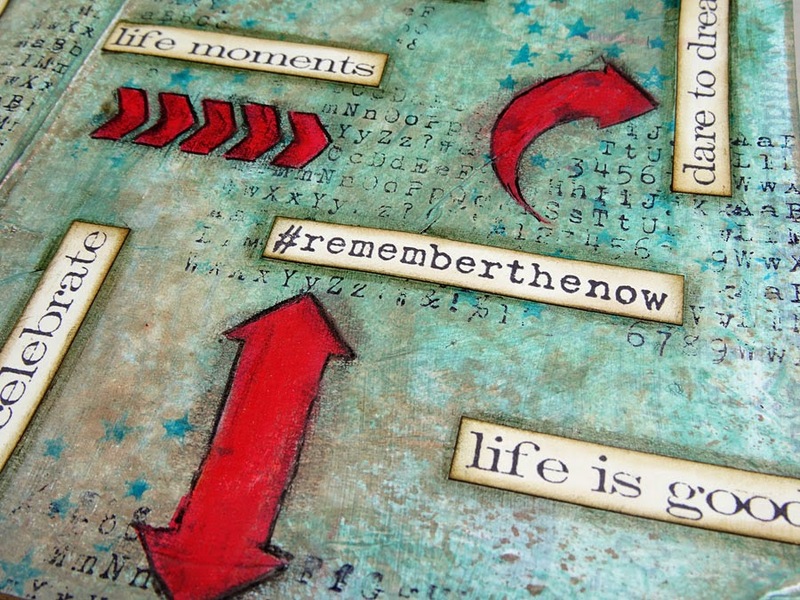 For my Remnant Rub Resist pages, I used combinations of Victorian Velvet, Dusty Concord, Festive Berries, and Abandoned Coral Distress Stain sprays for my background. And a variety of remnant rubs in my stash, mostly Botanical. 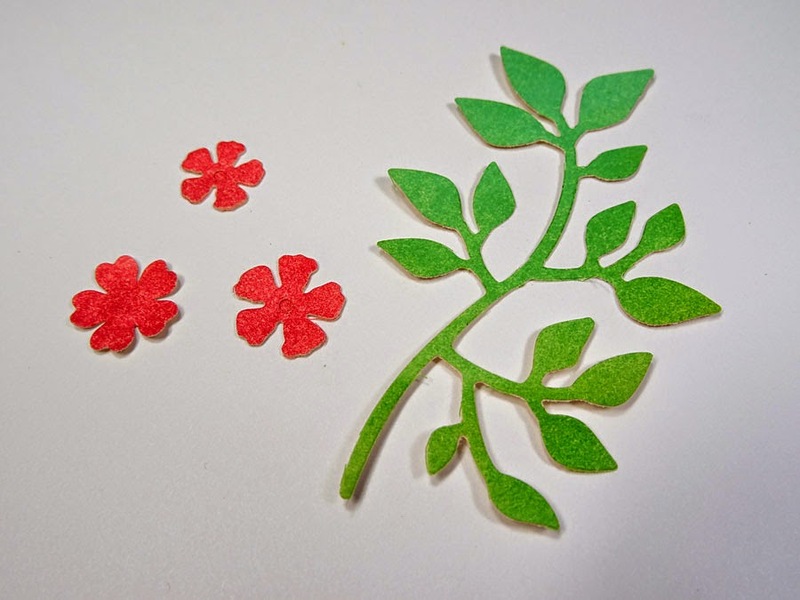 I colored some ivory card stock with Cracked Pistachio and Mown Lawn Distress inks, then die cut the Spring Greenery. 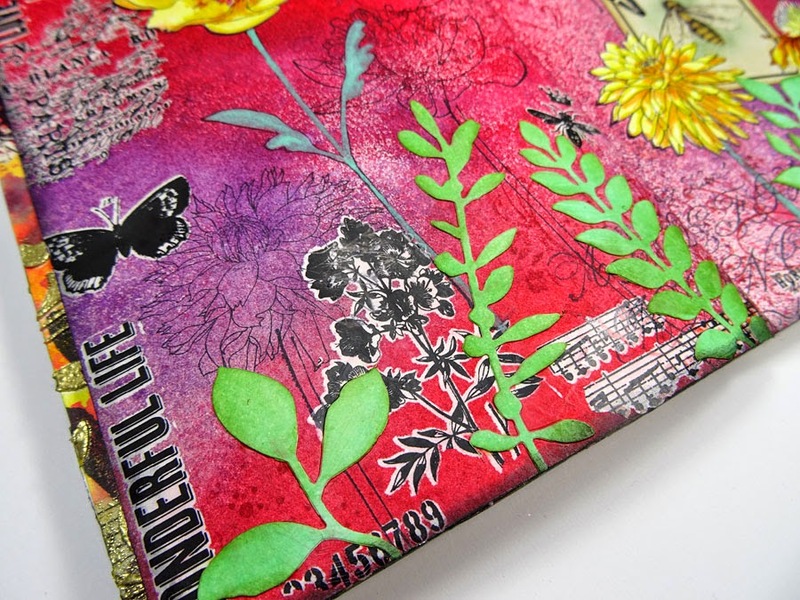 This new stamp set "Flower Garden" is such a beauty! 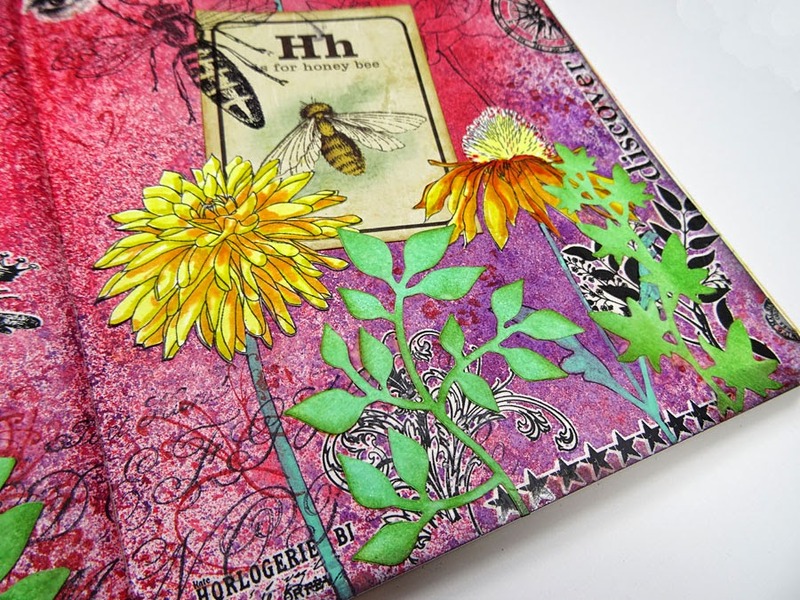 I stamped several with archival black ink onto ivory card stock, colored them with Distress Markers, and fussy cut them then adhered to my journal page. The stems were stamped directly onto the page. I painted them in with Cracked Pistachio Distress Paint with a thin paintbrush. While I started a bit late with the 12 Tags of 2015, (or in my case, Journal Pages) I am happy to share with you my pages, inspired by Tim's tags. 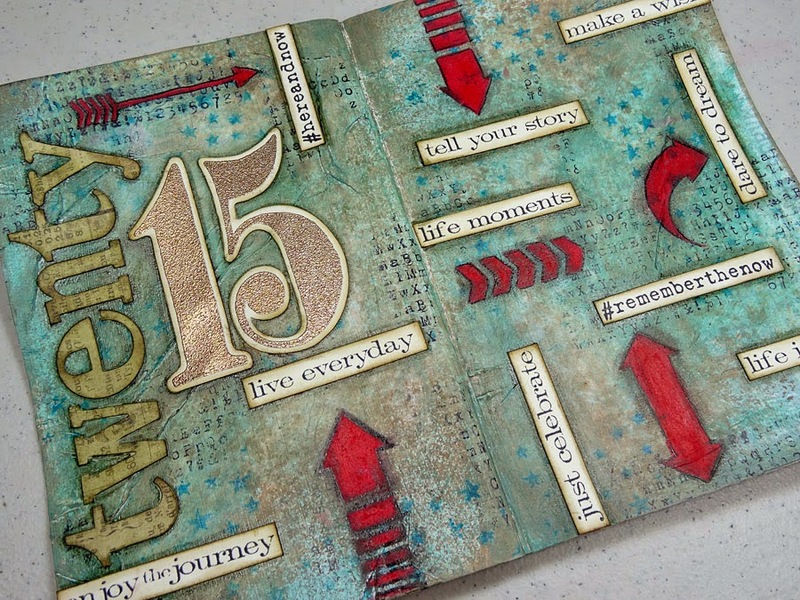 My January pages feature my favorite color combinations of greenish blues with pops of red. I seem to do this a lot, I notice. 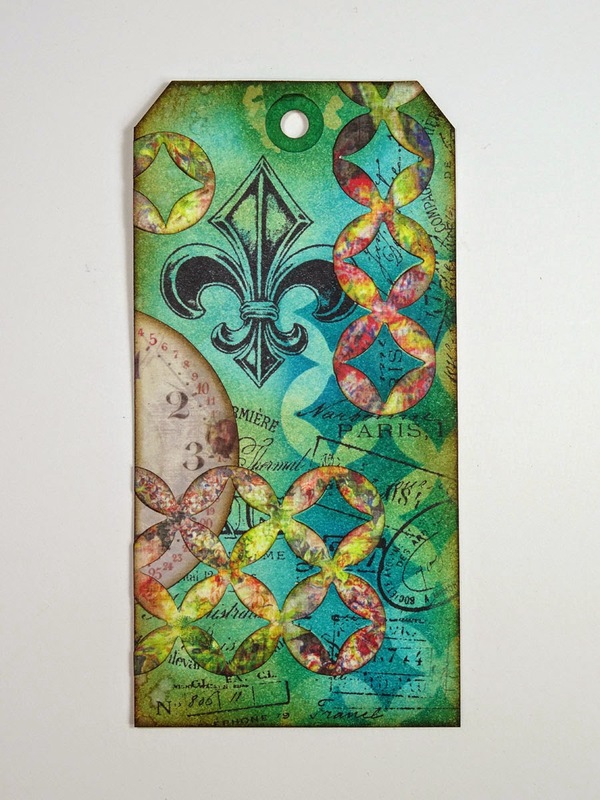 You can view Tim's awesome January tag here. 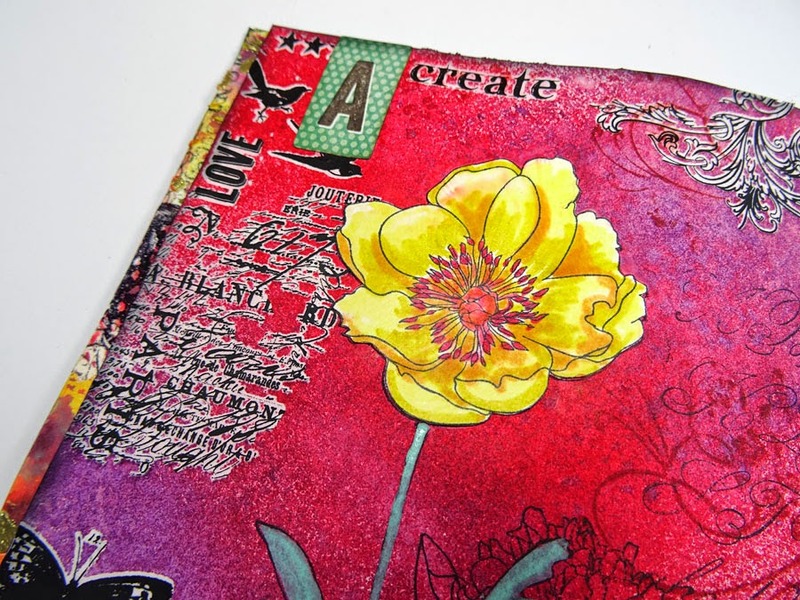 There are certain limitations when doing an art journal page, rather than a tag. One of which is bulk. 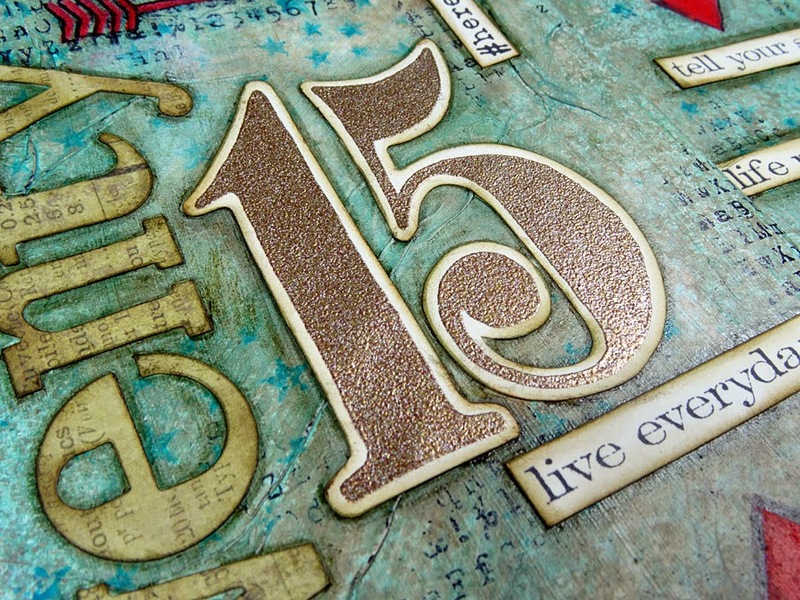 I need to keep my pages fairly flat, so I opted for embossing my 15. The chit-chat stickers Tim used are great for tags, but far too small in scale for my journal pages, so I created larger ones by stamping phrases from "Hashtags" and "Simple Sayings." 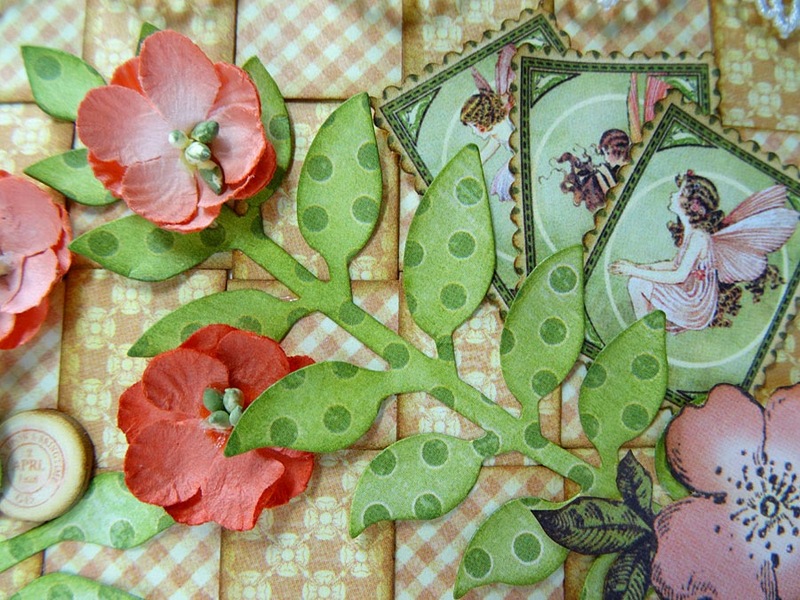 My February pages feature not only the Thrift Shop ephemera, but also cut-outs from the Wallflower paper. I mixed in some tissue tape (red, of course) to fill in certain areas. 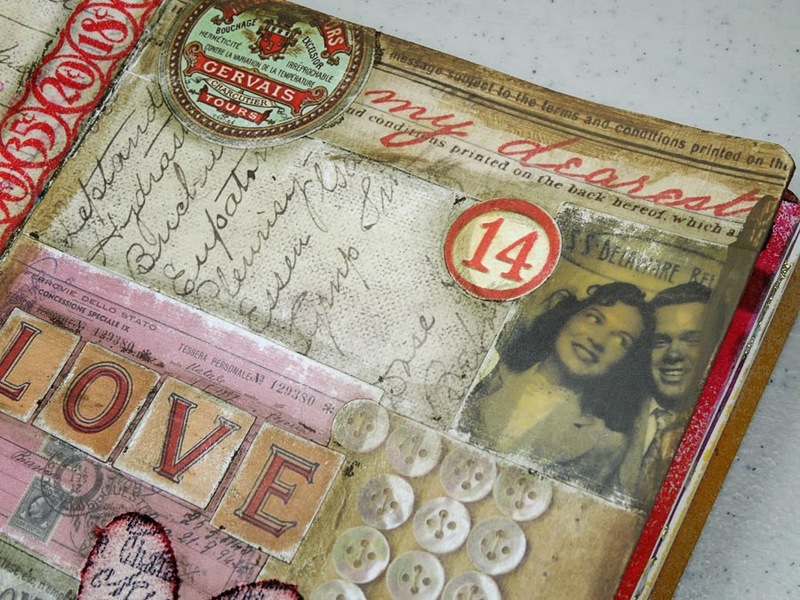 You can check out Tim's February tag here. I found a piece in one of the Wallflower papers that said, "My Dearest" in red. It was the perfect strip to run across the top of my page, over the happy couple. I posted my March pages a few days ago and gave you more of a step-by-step tutorial. If you missed it, you can check it out here. 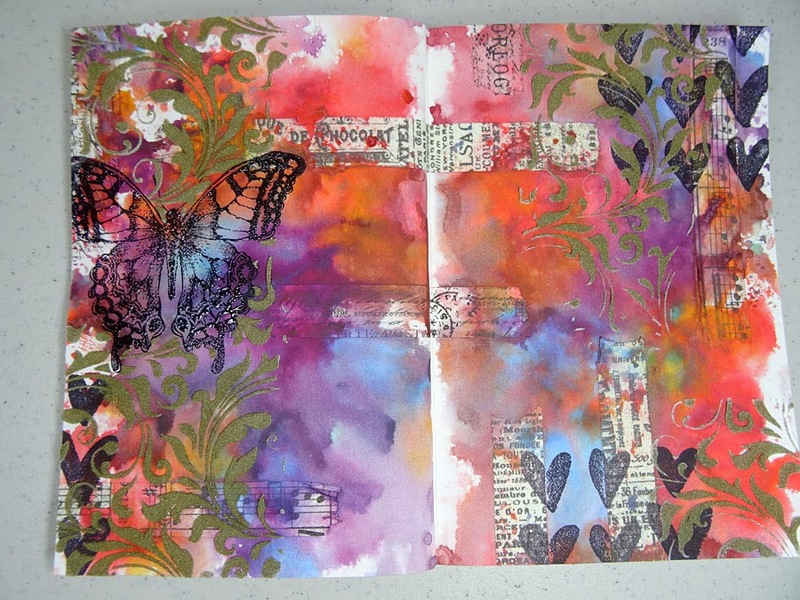 I'm having so much fun playing in my art journal. It's something I have always wanted to get comfortable with, and it's finally starting to feel easier each time I do it. The fear is subsiding and the enjoyment is growing. 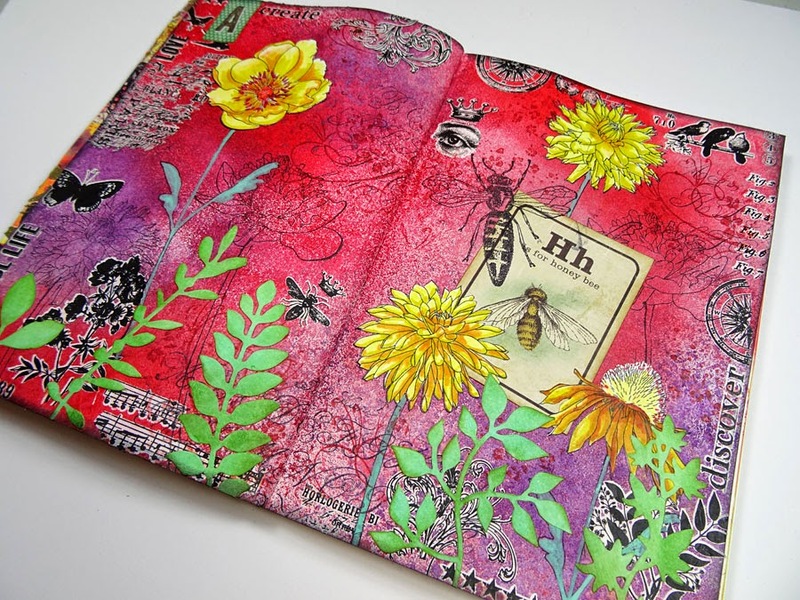 Are you art journaling? Join me, won't you. You can find all kinds of great products like the ones I used in these journal pages from InspirationEmporium.com. Thank you all for your sweet comments and support as I explore this new adventure on my creative journey. It's time again for another great Compendium of Curiosities Challenge. 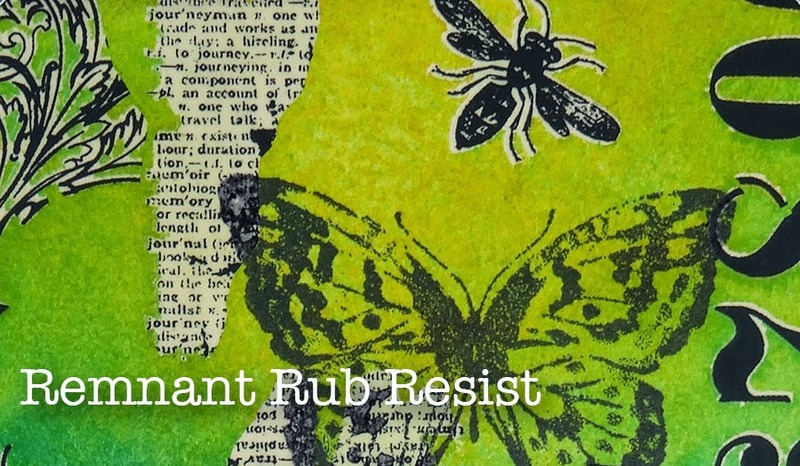 Today's challenge can be found on page 51 in the book, and it's called "Remnant Rub Resist." The Curiosity Crew is here to provide some inspiration to help kick-start your creativity. 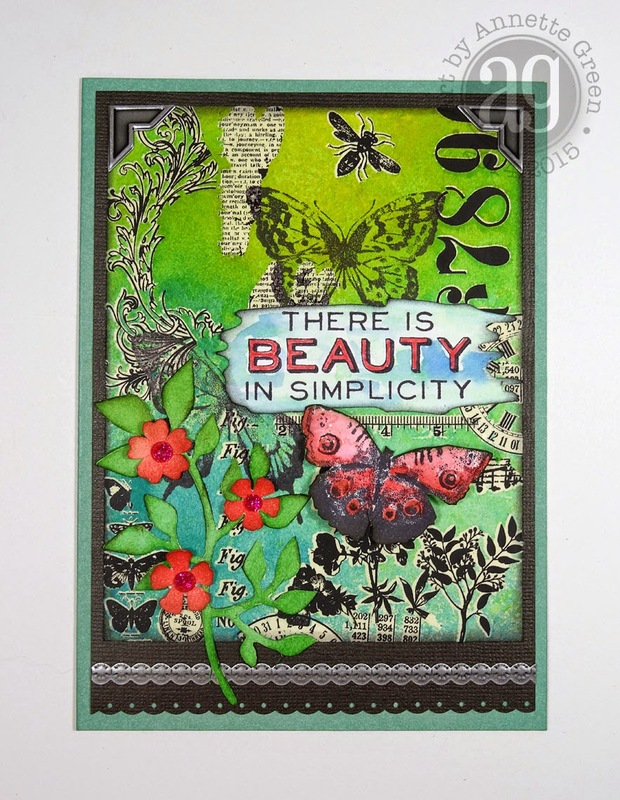 My creation is a simple card with a mixed media feel. I am also planning some art journal pages, which would be perfect with this fun technique. 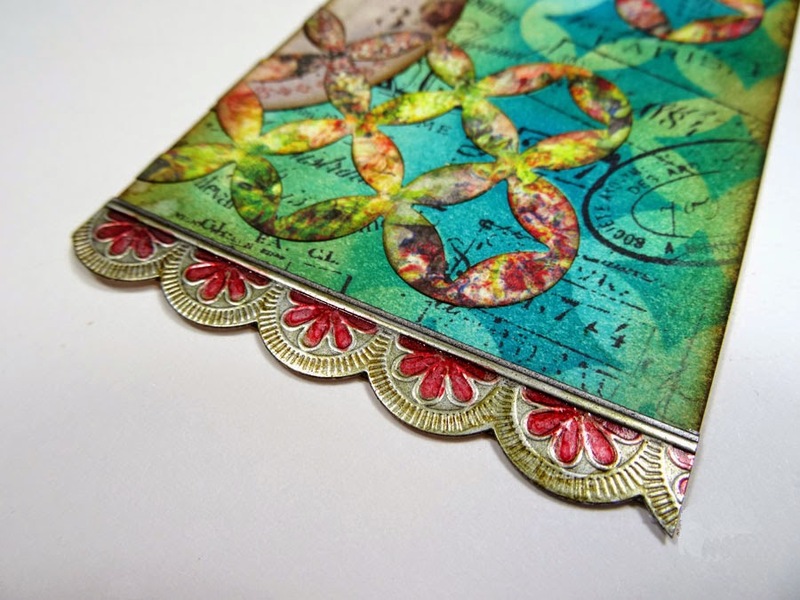 My card measures 4 1/2" x 6 1/4" and features some new Tim goodies, like Abandoned Coral, Cracked Pistachio, Perspective stamp set and Watercolor stamp set. Here's the technique using a mix of several packages of Remnant Rubs. The colors are Mustard Seed, Cracked Pistachio, and Broken China. (I failed to photograph the step where I stamped some butterflies onto my technique base, but you'll see it in the next photo.) 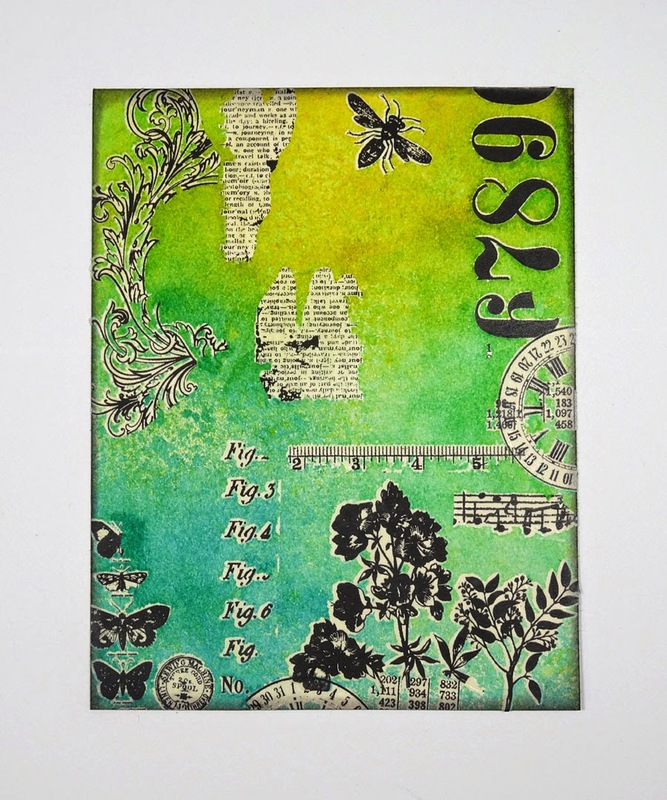 Here, I stamped some images from the two stamp sets using black archival ink onto Ranger Distress Watercolor Cardstock, then colored them with Distress Markers and the water brush. 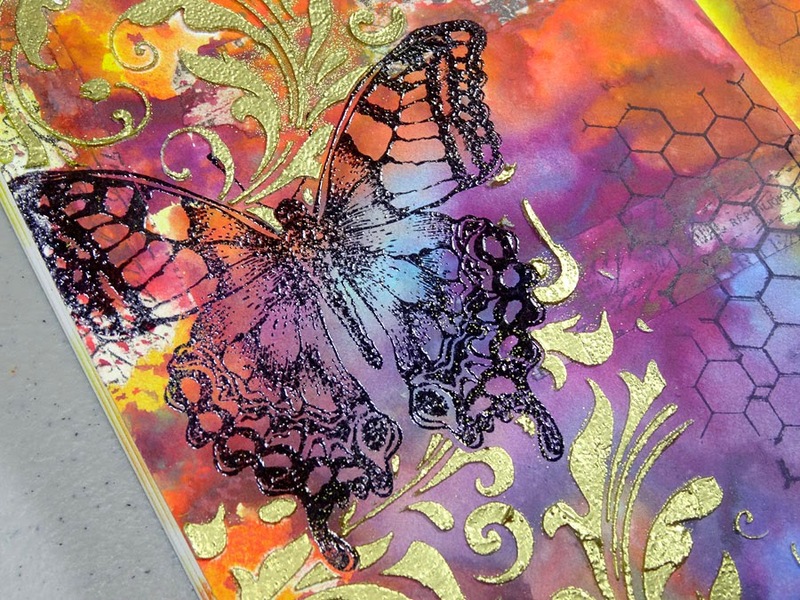 I folded the butterfly's wings slightly for dimension and attached her to the card. I cut the stamped phrase with my scissors in a free form way, sort of following the flow of the watercolors. I mounted this unit to black textured cardstock after punching a border at the bottom. Then mounted it all to some juniper cardstock. Finally, I added some Industrious Stickers to the top corners and along the bottom. 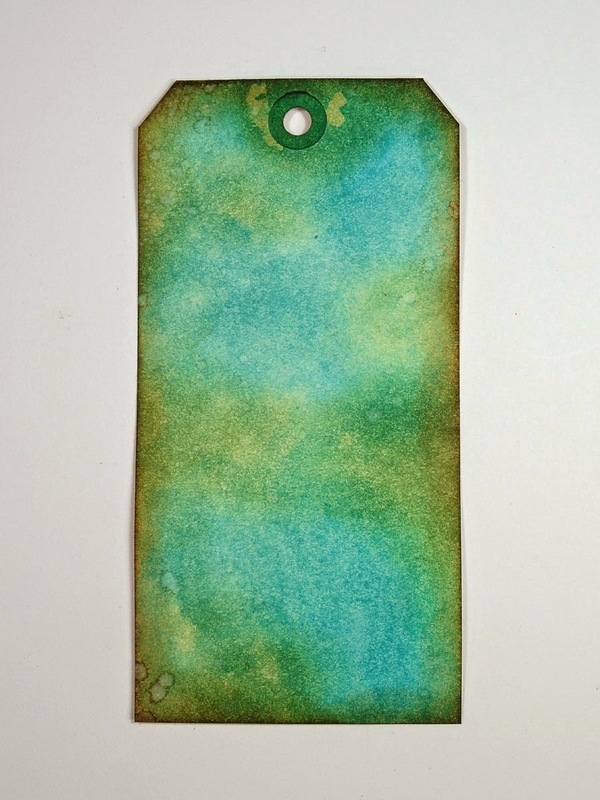 I grabbed some scrap pieces of manila tag and inked one with a combination of Abandoned Coral and Barn Door. The other is with Cracked Pistachio and Mown Lawn. Then die cut each. Tattered Flower Garden and Spring Greenery. After inking their edges slightly, I attached them to my card. 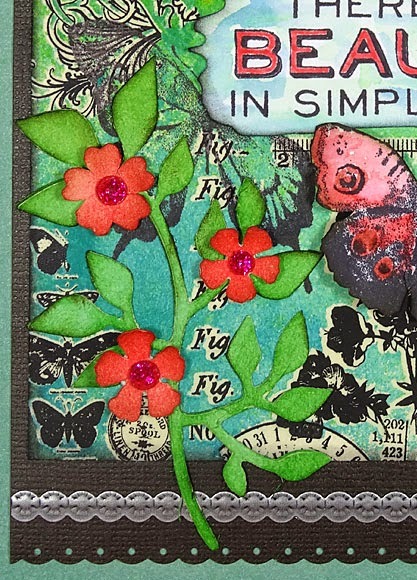 I popped on some pink glitter gems in the flowers' centers to tie in with the colors in the watercolor butterfly. Here's another look at the completed card. Now it's YOUR turn. I hope you join us in the fun with this easy and impressive technique. Hello everyone. 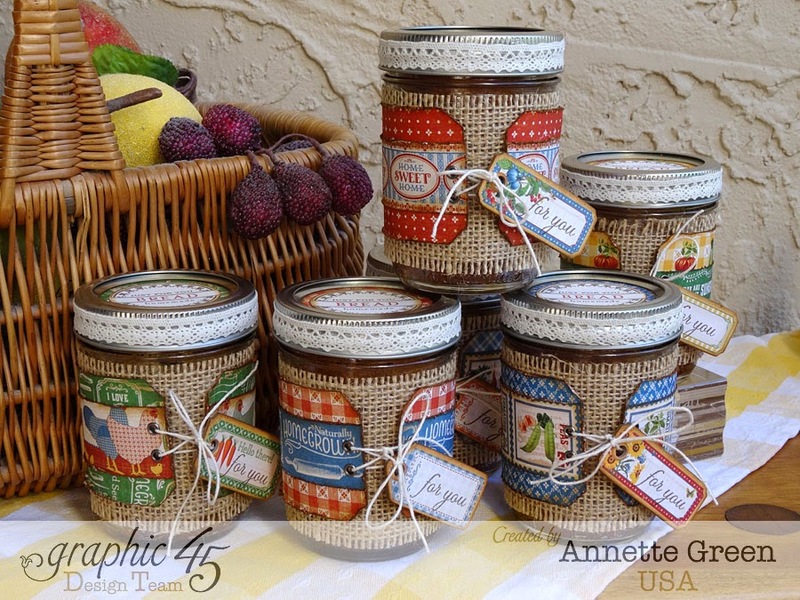 I've been having SUCH fun designing two new projects for Graphic 45 to teach this Spring! It's hard for me not to share. But I simply can't just yet. So that was just a big fat tease, I guess. (sorry) Just letting you know what I'm up to. Meanwhile, I ask you this: Are you receiving Graphic 45's newsletter straight to your inbox? 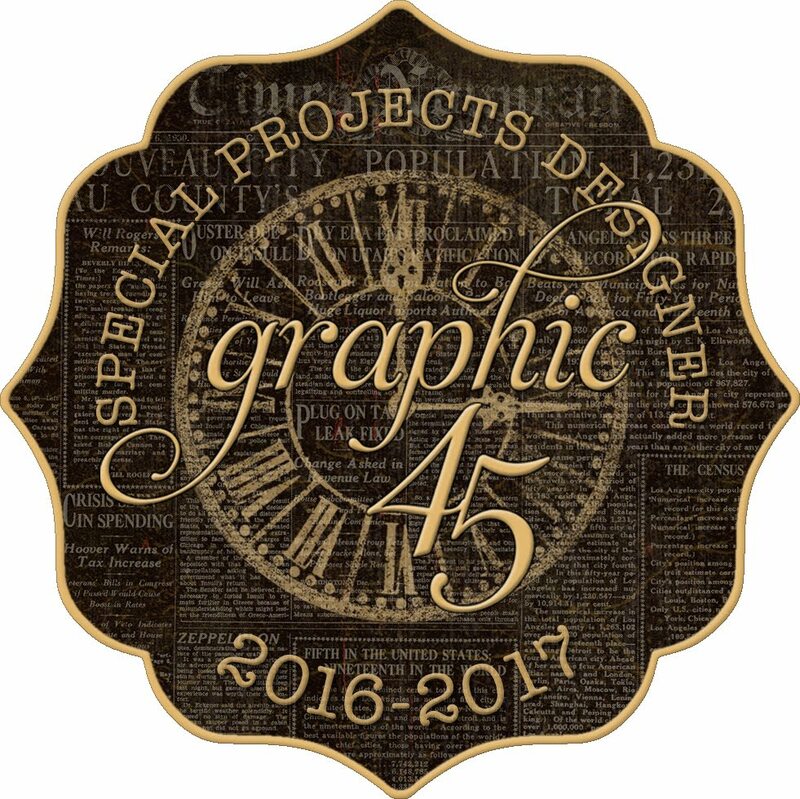 All you have to do is go to the Graphic 45 blog and subscribe so you don't miss a thing. Not only will you get their blog posts, you'll receive their special newsletters a few days in advance before they post on the blog. Why do I mention this? Because if you're not subscribed yet, you missed today's newsletter giving you a peek at my Home Sweet Home Baked Banana Bread In A Jar project and video. If you missed it, you can catch it this weekend on their blog. So if you don't want to miss these anymore, run over to the G45 blog and subscribe now! Be sure to leave me a comment, so I know you saw it. THANKS! As Graphic 45 prepares for the selection of new design team members for the 2015/16 term, they are giving the current team an opportunity to share our thoughts about what inspires us, why we craft, what we do for crafting motivation, what our crafting forte is, and our funniest craft disaster. It's going to be really fun to read everyone's responses! We're going in alphabetical order through the team. Andrew was featured yesterday and today is my day. So be sure to hop over to the Graphic 45 blog today and check it out. 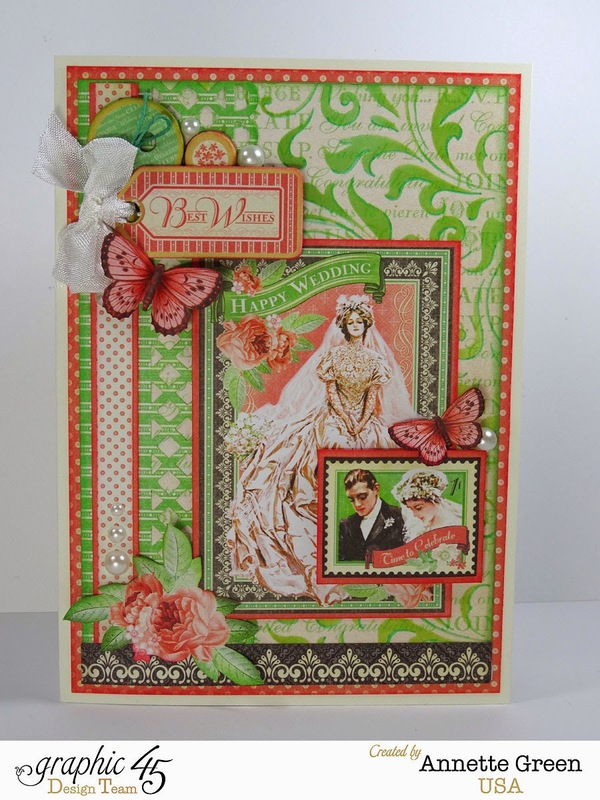 I've also shared a wedding card using Time To Celebrate with a Snapguide tutorial, showing how to incorporate stenciling in your card making. Here's a peek at my card. 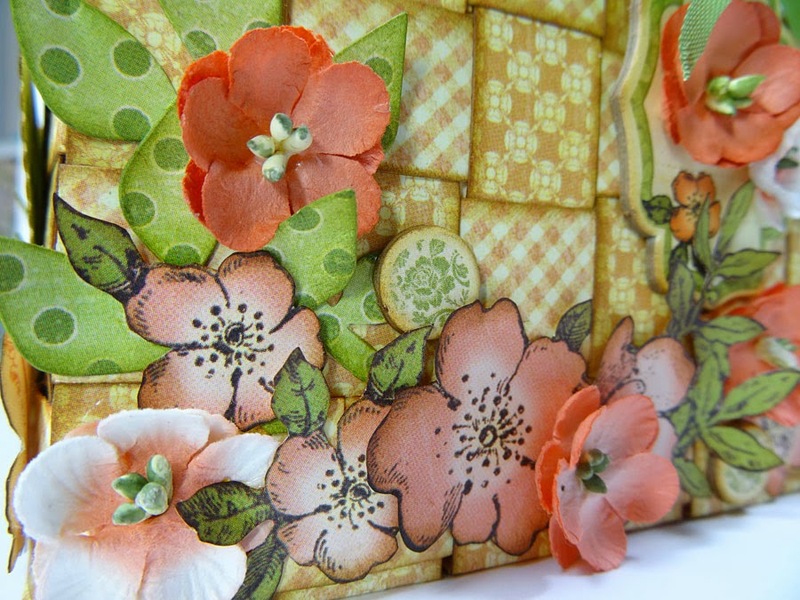 More photos and the tutorial on the G45 blog. Thanks for stopping in! Good Monday morning to you. I hope you start off your week crafty! 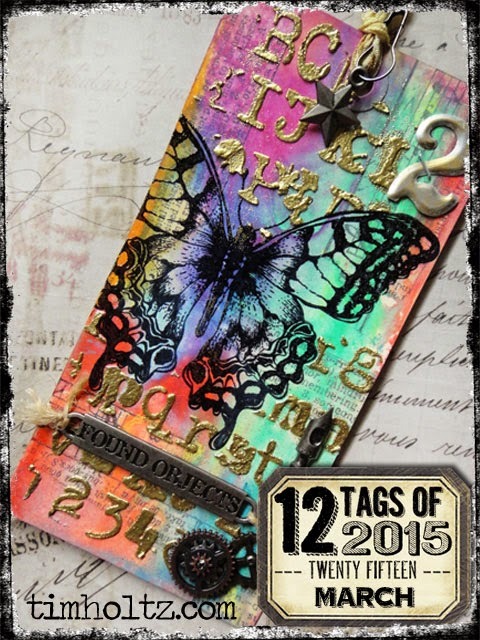 I decided to jump in on Tim Holtz's 12 Tags of 2015 and begin another art journal. Here is Tim's awesome tag above. This is my March layout. 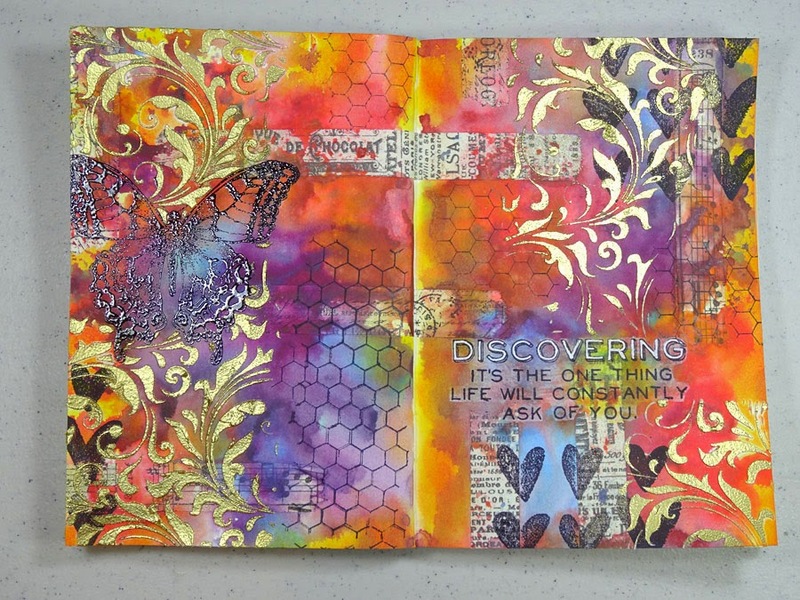 While I'm still a bit of a dabbler in the art journaling world, I LOVE to try. And I need as much practice as I can get. 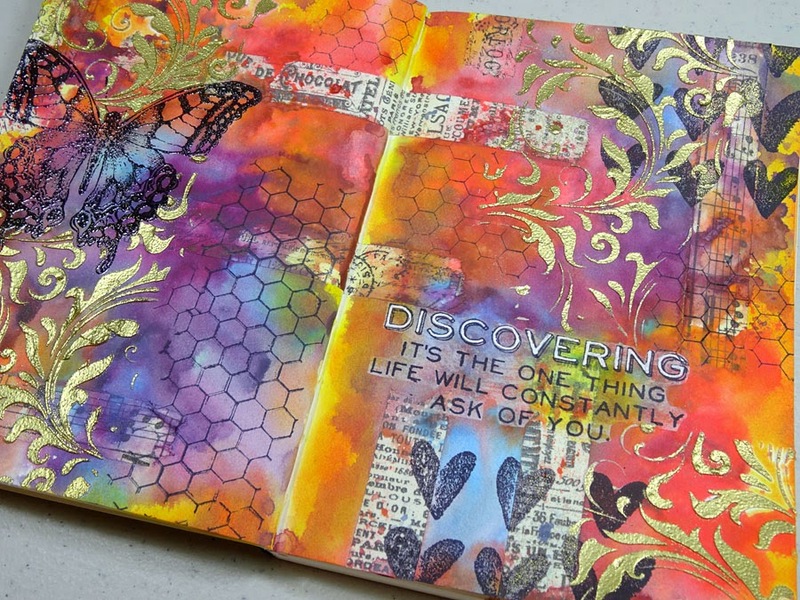 I'll be honest: when I open my art journal and see those blank pages in front of me, I sort of panic inside. How weird is that? Once I get going, it's usually okay but I still have this thing about something going wrong, or not liking it once it's done. I really need to just get over it, I know. I think I've found a simple solution for myself: I got a second journal. A practice journal in essence and it really works for me. Now I use one for experimenting, testing, and trying. Then use the other one to do my actual pages from what I learned from the first one. This takes a tremendous amount of pressure off and allows me to play around. No one has to see the first one. Ever. 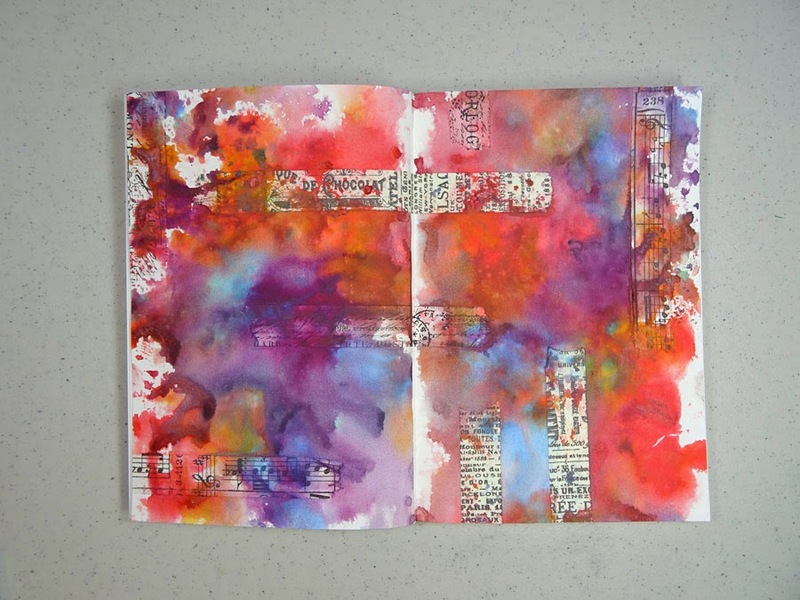 In my practice journal (not shown) I dabbed the paints right onto the page and spread them around with a baby wipe. It gave a soft blended look to the page, but seemed flat and boring. 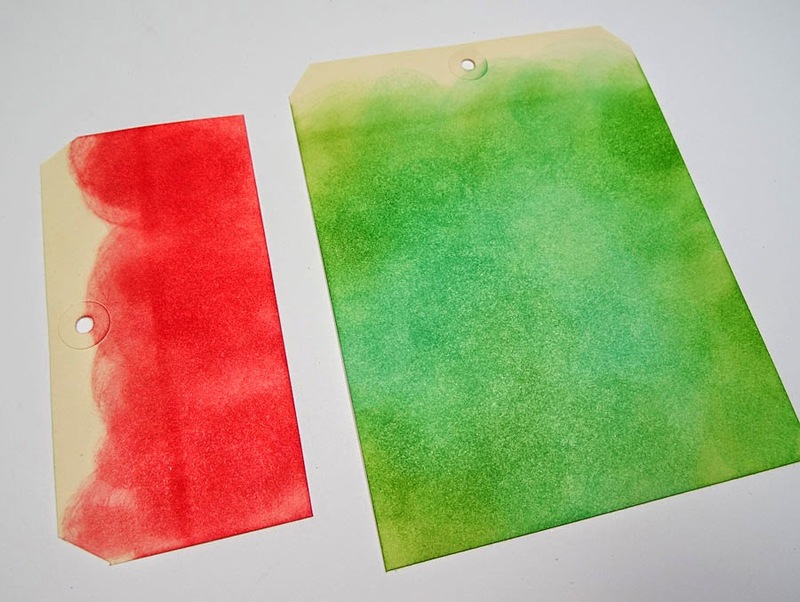 So for my "real" journal, I tried dabbing the paints onto a small piece of a non-stick craft sheet (I cut an old craft sheet apart into four equal sized pieces) then picked up the sheet and mushed it onto the pages. Whoa! It was bright, but I liked it better than the softer blended one. So I stuck with it. I did some stamping of hearts next, then did Tim's technique for the March tag. I love that big butterfly and I also love using his masks. 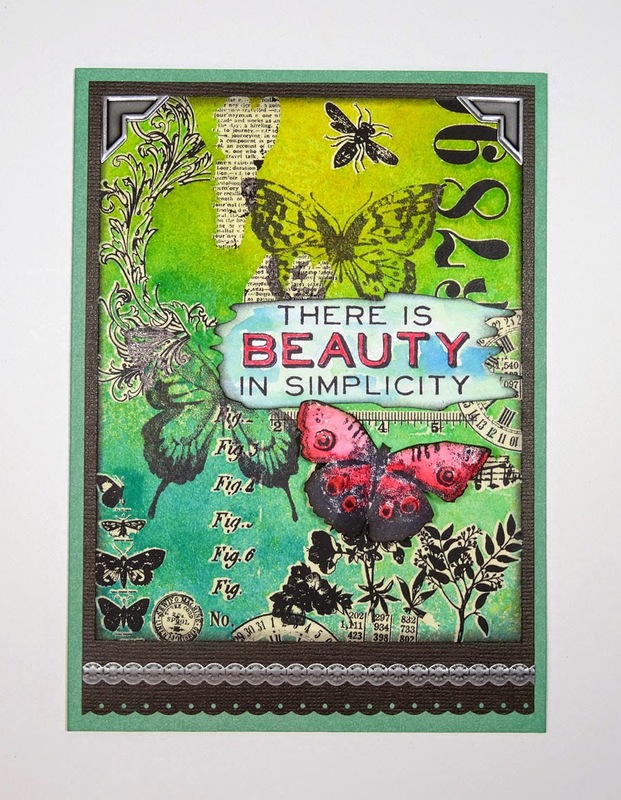 Great technique with the embossing paste and powder too! I ended up not liking all the stark white spaces, so I filled in with Mustard Seed and Abandoned Coral Distress Inks with a blending tool. Much better. I stamped the phrase onto white tissue paper (the cheap gift wrap type) with black archival ink, let it dry, then glued it onto my page with mat medium. 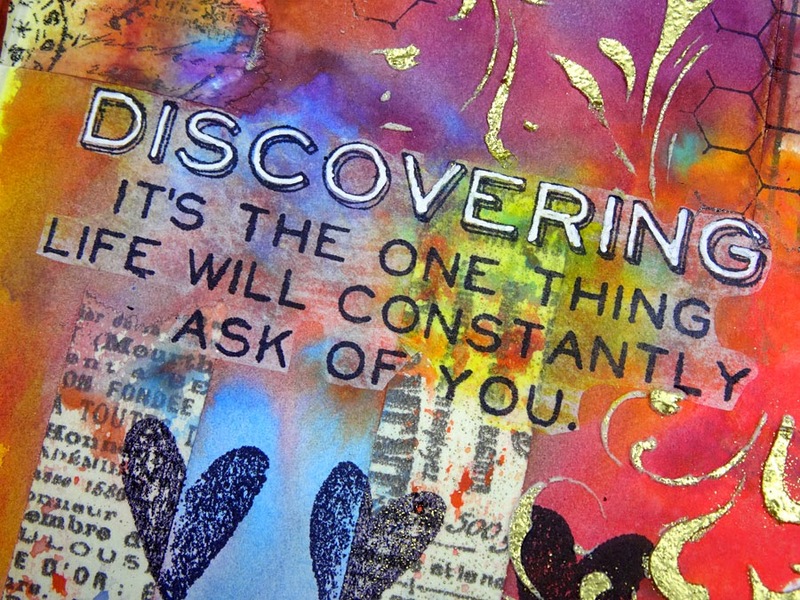 Once dry again, I colored inside the word "Discovering" with a white gel pen.